Print or photocopy titles framed with bright colors matched to preprinted tabs. Two-in-one tabs provide choice of portrait or landscape format. Makes referencing easy and professional-looking. I use many of these table of contents dividers for the reason that I am a genealogist and have many binders with information to keep and work with. They are my favorite dividers with the front page where you can write what each section contains rather that try and fit the information on the small tab itself. Good product! Makes my Financial record neat and professional looking. Transcript: Welcome to MyBinding.com. These are the Avery 12 Tab Contemporary Multicolor Dividers. These Avery dividers are a great way to organize any binder. These colorful dividers come with a coordinated table of contents. Simply handwrite the table of contents, or go Avery.com for printing templates. A sturdy reinforcing strip keeps the holes from tearing out when turning. They’re an all around practical and reliable design. Welcome to MyBinding.com. 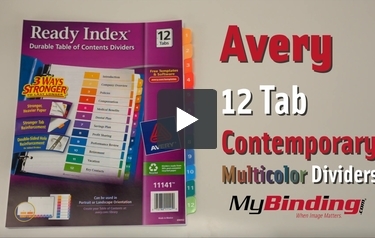 These are the Avery 12 Tab Contemporary Multicolor Dividers.